The “Road to the Kentucky Derby Presented by Woodford Reserve” officially begins Saturday as 12 promising 2-year-olds, led by Hall of Fame trainer Steve Asmussen's duo of Saratoga Special (Grade II) runner-up Tight Ten and Ellis Park Juvenile winner Tobacco Road, were entered in the 37th running of the $150,000 Iroquois Stakes (GIII) at Churchill Downs. The 1 1/16-mile Iroquois, one of four stakes events on the first Saturday of the 11-day September Meet, is the first scoring race on the 2018-19 “Road to the Kentucky Derby” – the series of 35 races that will ultimately determine the field for the 145th running of the Kentucky Derby Presented by Woodford Reserve (GI) on Saturday, May 4, 2019. Points awarded to the Top 4 Iroquois finishers will be 10-4-2-1 as part of the 19-race “Prep Season” that showcases foundation-building races in advance of the “Kentucky Derby Championship Series,” which begins in late February. The Iroquois also is part of the Breeders' Cup “Win & You're In” program with the winner receiving an automatic berth into the $2 million Sentient Jet Breeders' Cup Juvenile (GI) on Nov. 2 at Churchill Downs. The Breeders' Cup Juvenile is the featured race on “Future Stars Friday” – the 10-race program that includes four additional Breeders' Cup races for 2-year-olds: the $2 million Juvenile Fillies (GI), $1 million Juvenile Turf (GI), $1 million Juvenile Fillies Turf (GI) and $1 million Juvenile Turf Sprint. Headlining Saturday's Iroquois field is Winchell Thoroughbreds' Tight Ten (2-1-1-0—$70,600). The 2-year-old Tapit colt impressively broke his maiden by 4 ¼ lengths under Ricardo Santana Jr. on June 28 at Churchill Downs. The homebred spent July and August at Saratoga Race Course and finished a game runner-up behind Call Paul in the Aug. 12 Saratoga Special. Joining Tight Ten in the Iroquois starting gate is stablemate Tobacco Road (3-2-0-0—$70,905). Owned by L and N Racing, the Quality Road colt rallied from off the pace as the 9-5 post time favorite under leading rider Corey Lanerie to narrowly win the $75,000 Ellis Park Juvenile on Aug. 19 over Whiskey Echo and Manny Wah. Santana has the return call on Tight Ten and drew post position four while Julien Leparoux picks up the mount on Tobacco Road and drew post position six. Susan Moulton's Manny Wah will once again line up against Tobacco Road for a rematch of the Ellis Park Juvenile. 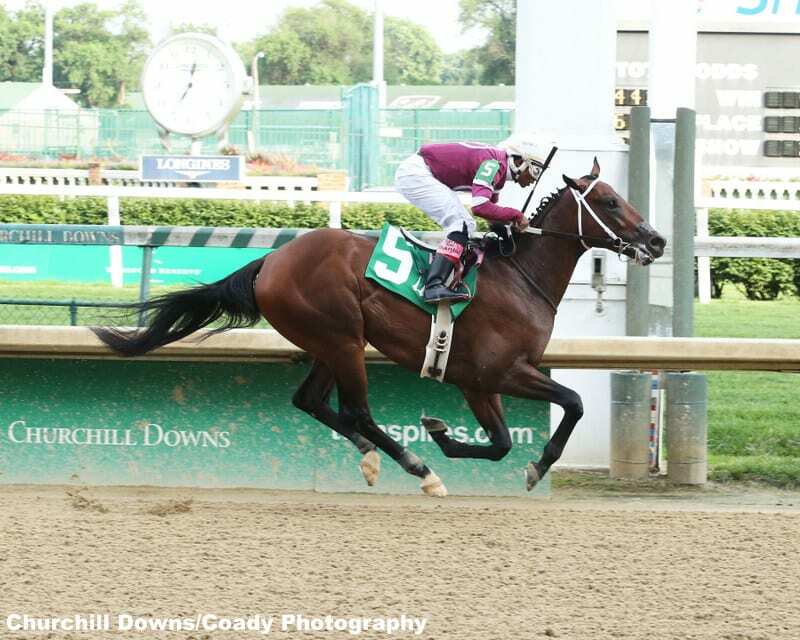 The chestnut colt broke his maiden in his second-career start under Channing Hill over the synthetic surface of Arlington Park in late July prior to finishing three-quarters of a length behind Tobacco Road in the Ellis Park Juvenile. Other top contenders lined up in the Iroquois are Something Special Racing's fast-closing maiden winner Hog Creek Hustle (1-1-0-0—$25,200) for trainer Vickie Foley; Calumet Farm's debut winner Everfast (1-1-0-0—$25,200) for Churchill Downs' all-time leading trainer Dale Romans; and Big Chief Racing, Madaket Stables and Rocker Ranch's Best Pal (GII) third-place finisher Synthesis (4-0-0-3—$41,160) for Keith Desormeaux. The complete Iroquois field from the rail out (with jockey, trainer and assigned weight): Mr Wrench It (Euclyn Prentice Jr., Coty Davidson, 120 pounds); Royal Urn (Leonel Reyes, Michelle Nihei, 118); Drunk as a Skunk (Joe Rocco Jr., Doug Anderson, 118); Tight Ten (Santana, Asmussen, 118); My Sixth Sense (Shaun Bridgmohan, Mark Casse, 118); Tobacco Road (Leparoux, Asmussen, 120); Pole Setter (Florent Geroux, Brad Cox, 118); Cairo Cat (Brian Hernandez Jr., Kenny McPeek, 118); Manny Wah (Hill, Catalano, 118); Hog Creek Hustle (Lanerie, Foley, 118); Synthesis (Drayden Van Dyke, Keith Desormeaux, 118); and Everfast (Robby Albarado, Dale Romans, 118). The Iroquois is carded as Race 10 at 5:26 p.m. (all times Eastern) on an 11-race card that begins at 12:45 p.m.
Other stakes races on Saturday's program are the 35th running of the $100,000 Locust Grove (GIII) for fillies and mares at 1 1/16 miles and the 10th running of the $100,000 Open Mind (Listed) for fillies and mares at six furlongs. The four stakes, which are the last four races on the card, comprise an all-stakes late Pick 4 and are part of the late Pick 5 and Single 6 Jackpot sequence. The sixth annual September Meet begins Friday at Churchill Downs with a 10-race program at 12:45 p.m. and continues on a Thursday-Sunday schedule through Sept. 30. This year's three-week, boutique race meeting will feature record purse levels as horsemen compete for $5.275 million in prize money, which averages to $479,545 per day. Opening weekend weather in Louisville will be ideal, according to the National Weather Service, with a forecast of mostly sunny skies and temperatures in the 80s. This entry was posted in Breeders' Cup, NL List and tagged Iroquois Stakes, kentucky derby, Kentucky Derby 2019, road to the kentucky derby, steve asmussen, tight ten, tobacco road by Press Release. Bookmark the permalink.